You are here: Home » How do I best secure my farm? 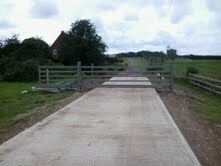 Your first step is to ensure your farm has a good, solid entrance gate that is kept closed at all times. An open entrance is just an invitation to thieves and allows them to have a good look round with the intent to return later and help themselves to the very items that you rely on to make a living. With our farming background, we understand how much of a target your property is and we keep abreast of the latest ploys used by thieves. Thieves like to be able to make a swift exit and a closed gate is a real deterrent as it prevents them from doing this. However, keeping your gate shut can be a real inconvenience when you have large machinery coming and going throughout the day, and especially when your farm entrance doesn’t allow enough room for you to pull off the road safely while you wait for it to open. This is where an automated gate comes into its own, not only enhancing your farm but providing you with the peace of mind that your farm is secure! 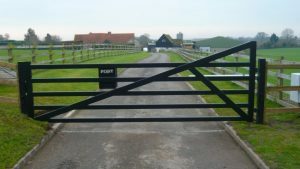 Take a good look at your farm security and the measures you could implement to put thieves off with your entrance gate being the first thing to consider. With the recent increase in farm diversification it is likely that you will have increased traffic on your farm with a legitimate reason for being there but how can you be sure that all visitors are who they say they are? Businesses looking to rent units on your farm will also look at the security measures you have put in place when deciding upon whether to base themselves there. They may potentially have thousands of pounds worth of stock which needs protecting by a secure entrance gate. Many farms that previously had livestock grazing their fields now have horses and make a good alternative income from liveries. Horses are unpredictable and flighty so a closed gate is an absolute must for most owners. Tack and horse theft are also on the increase so by securing your farm you can at least give your clients some peace of mind! An AutoGates installation can also ensure livestock, pets and children don’t escape out onto the road and you can rest assured that we comply with all EU directives concerning the safety of electric gates so those dearest to you will not be at risk. We assess each site and take into consideration things such as wind. the style and weight of gate, and the risk of flooding which then helps us to decide which automation equipment is most suitable. Many remote sites are subject to extreme winds which does mean we would need to fit 240v motors to ensure they can close your gate but to counter the risk of crushing we fit active safety edges which ensure the gate(s) will back off should they come into contact with a person or object. Which style of gate offers me the best level of security? Due to the Cantilever gate sliding between two ‘goal post’ type posts, this is the most secure style of gate as it cannot be forced open like a swing gate. 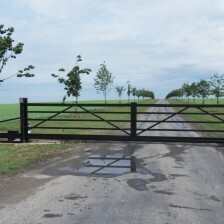 Most farm gates are approximately 1.2m high and this seems a popular choice, unless you have a small industrial unit and require a greater level of security, bearing in mind how easily your farm can be accessed by open fields. The purpose of a gate is to prevent unwanted people entering and with automation, this ensures you are not inconvenienced. 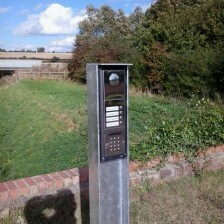 We can provide a steel cover for a sliding gate motor which is also fitted to cantilever gates. This ensures it cannot be easily tampered with. Recommended gates; Ashwell, Reed, Wicken, Barley Barrier. Controlling who has access to your farm even when you are miles away is now a very popular choice with many of our installations having a wireless G.S.M. intercom fitted. This works off the mobile phone network so there is no need to run a cable to the gate. A SIM card is inserted which can either be on contract or PAYG (much the same as a mobile phone). You can instruct the gate to open and shut by either text message or by calling the intercom, multiple mobile phone numbers can be stored on the memory to allow friends, staff, and clients to text the intercom to open the gate, and more importantly, anyone standing at the gate wishing to enter can speak with you and you can decide whether to open the gate for them. This is invaluable when expecting a delivery but you can’t afford to wait around for it. Keypads, ground loops, passy transponders, and simple radio transmitters are also suitable entry access methods. A secure automated entrance gate can help you to obtain a reduction on your insurance premium when it is time to renew. If you request a discount then the fact that you have a secure gate will mean that underwriters deem you to be a ‘superior risk’ and this could save you money! As recently quoted by the NFU, “The value of commodities such as oil and metal, appear to be driving farm theft resurgence. Animals too can be lucrative items.” In our area alone, there have been a number of livestock thefts reported in recent weeks.